How often you are faced with installation of Windows on a new system or format an old system to clean install the windows operating system? I know, most of you are too scared to do that. For those of you, who did try this kind of adventure, carrying and keeping Windows CD/DVD installation media is a pain. You are always scared of any scratches on the installation media even though you have kept in the original box. You people will love the idea of transferring those bootable CD/DVDs and files to a flash drive, USB or even a portable HDD so that you can use them whenever you need without worrying about scratches. Also, Flash media is much faster, both in terms of data transfer speed and data writing speed compared to conventional CD/DVD media making your installations fast and smooth. 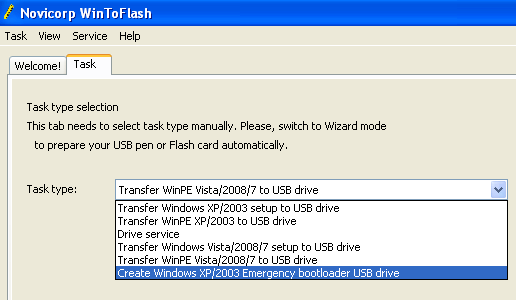 WinToFlash is such a great tool/application which will let you transferÂ Windows XP, Windows 2003, Windows Vista, Windows 2008, Windows 7 setup from CD/DVD to flash card, USB stick, HDD, etc in a few simple steps. Hence you can install Windows from flash card, USB stick, HDD, etc to your computer or netbook or laptop without carrying CD/DVD media. The steps are too simple. It asks you the location of setup files and location of your Flash drive where you want to save the bootable installation files. That’s all. After this just run the application and you are done.